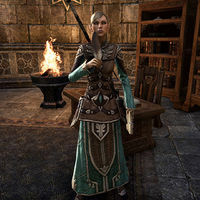 Valaste is an Altmer member of the Mages Guild. She is the Master of Incunabula, responsible for maintaining the guild's libraries, arcanaea, and seeking out new and interesting works to add to the collection. At the conclusion of The Mad God's Bargain, Valaste will make a permanent home outside the guild hall on Eyevea. Simply Misplaced: Recover two items that the Mad God claims to have misplaced. Circus of Cheerful Slaughter: Take part in Sheogorath's production, The Folly of Isolation. Chateau of the Ravenous Rodent: Explore Sheogorath's dark manse to recover the final book. Before you join the guild, she'll only say, "If you want to join the Mages Guild, please see the magister. I have pressing issues I must attend to." After joining she will have a quest for you. "Well met, Adept. I believe I may have a task for you." "New members are the lifeblood of the Mages Guild. Especially for retrieval missions. I've received word about a possible store of ancient knowledge in a ruin nearby. I'd like you to retrieve it for me." "To the north of the city lies the ruin known as Ondil. If you please, investigate the ruin and bring back any interesting books you can find." "The ruins of Ondil are a dark and dangerous place. Tread carefully, Adept." What is your role in the Mages Guild? "I am the Master of Incunabula, the keeper of tomes. I've come here to inspect the Arcanaeum, the guild's library. I've dedicated my life to expanding our guild's knowledge. Standards must be kept." How did you learn about these books? "We have ears everywhere, Adept. An intelligence report fell into my hands that mentioned these tomes." I thought the Guild was neutral in the war? "We are neutral in the war for Cyrodiil. And proud of it. That doesn't mean we don't take an interest when the Eyes of the Queen notice something." "The intelligence arm of the Aldmeri Dominion. Personally loyal to her Majesty Queen Ayrenn. My understanding is that many of their members used to adventure with Her Highness during her wild days." "I don't know. It's always a delicious mystery, cracking open a book for the first time. They could be anything from ancient recipes for stew to high arcana. Even racy journals penned by Elven poets!" After getting the tomes, return to Valaste. "Were you successful? Do you have the tomes?" Yes, I have them right here. And something strange happened. "Well done! You're already proving your worth to the guild. Sorry, did you say strange? What happened?" An old man in robes appeared to me. He said his name was Shalidor? "Shalidor! Labyrinthian's father, the Spellmirror's forger. Are you speaking truly? And uh... this book's pages are blank. Why is it glowing?" Shalidor appeared right after I picked up that book. He said fire would show you the words. "The spellwrights of the First Era used a special ink that would remain invisible until immersed in arcane fire. Perhaps that's what he meant? We have a brazier nearby burning with such a fire. Let's see what the flames reveal." "Cast the book into the arcane fire. Fear not. The pages will not burn." Can you tell me more of Shalidor? "Shalidor was the most famous arch-mage of the First Era. His dedication to spellcraft and his commitment to research were unmatched by any before or since. Most mages revere him, though he does have his critics." Why would he be criticized? "Shalidor felt that one should earn the right to be called "mage". He created many trials to test the spellcasting mettle of men and mer. His loudest detractors were those who failed those tests." "What has the fire revealed?" I can't understand the words here. They must be very complex spells. "Complex indeed. Much of this is beyond my understanding, but... here. This one is an attunement spell. We can summon Arch-Mage Shalidor himself! We'll need some ritual orbs..."
What do these orbs do? "They'll focus your Magicka, attune your life energies, and draw him to this place. The ritual will apparently also link your mind with his." "It means that the arch-mage will be able to guide you, and speak to you whenever he chooses. Are you ready to begin?" She'll say, "To the center!" Valaste: "First, we attune your spirit to Shalidor's." Valaste: "Ready. When you're set, use the orb before you." "Use the crystal, Adept. It will prove you worthy... or lacking." Arch-Mage Shalidor will be able to materialize and open a portal to the realm of Sheogorath. Return to Valaste with the first tome. "You radiate an aura of power. Does this mean you have the books?" Only one. Sheogorath is going to make us pass tests to earn the others. "Tests. Well, that's a start. I suppose. What of Shalidor? He was drawn away from here in a burst of light." "Not good. Not good. I'll start translating this right away, but I hope Shalidor returns to help." Sheogorath cursed the tome. Shalidor can't read it. "Xarxes' backside! Then this is going to take a while. Check in at a guild hall from time to time. I'll leave word for you when I've finished." "In the meantime, keep an eye out during your travels. There are many lost tomes scattered throughout Tamriel. Who knows? Any one of these books may help us restore Shalidor's lost island haven." "Pardon me. I must begin this translation. These runes... fascinating." "Terrifying isn't he? The will and attention of a child, with the power of a Daedric Prince." "Well, look on the bright side. You're still upright on two legs. You're not inside-out, or bright purple, or afflicted with new, angry limbs. It could be worse." Shalidor will direct you to Valaste, who has progressed with the tome. "Shalidor found you! Good to see you again. I've deciphered the spell inside the book. Are you prepared for Sheogorath's first test?" "Excellent. It's been fascinating to work with Shalidor. Even though he can't read the book, he's been an invaluable resource. I had to decipher layers-upon-layers of meaning hidden within the tome." "Yes. Speak with the Archmage. He's meditating on the challenges ahead. I'm still somewhat... drained from my efforts, se he'll open the portal to the Shivering Isles for you." "Auri-El watch your steps. I'm very excited about this project. Shalidor's sanctuary would be a boon to every mage in Tamriel. Even Guildmaster Vanus approves of our work here!" What can you tell me about the book? "I'm so glad you asked! On the surface it's a simple book of nursery rhymes from the Dunmer land of Stonefalls. But that's just on the surface." There's more to it than children's stories? "So much more! Each story has hidden meanings. Clever references to arcane lore, twisting and turning into the depths of history. It was fascinating to fully unlock the secrets of the book. Sheogorath may be a madman, but he's also a genius!" Do you know anything about where I'm going? "Not much. We tried to scry Oblivion, to get a sense of the place. I couldn't see anything, but I was swept up in a strong sense of homesickness." "I came of age where most High Elves do: the beautiful green shores of the Summerset Isles. I often think of the pink petals and soft breezes of my homeland. I'm not sure why those memories returned to me today, though." Could you remind me about this sanctuary? "Of course, adept. While investigating some ruins for me you caught the notice of Arch-Mage Shalidor, ancient patron of mages everywhere. We're working with him to complete the Mad God Sheogorath's trials and recover Shalidor's lost sanctuary." What's it like working with Shalidor? "A genuine pleasure. He has a fascinating view of history from a firsthand perspective! And his knowledge of the deeper mysteries is... well. I feel like an apprentice again." Valaste, are you enjoying this more than you're letting on? "Adept, what transpires between myself and the Archmagus is between us and no one else. I don't need to answer your questions or anyone else's." "Eyevea, it's called. In ages past, it was an island in the Summerset Isles. Set aside for mages across Tamriel, Shalidor worked tirelessly to make it a sanctuary. And just barely escaped when Sheogorath claimed it." Has he spoken at all about how the sanctuary was lost? "He still won't tell me what happened. I gather that there was some kind of bargain between them, and Sheogorath came out the better." Return to Valaste after securing the next tome. "Ah, you've returned. Do you have the second book?" "Excellent... "The Circus of Cheerful Slaughter?" That's quite a title! I'll begin my research immediately. Can't wait to get to it." This completes the quest. Should you talk to her again, she'll say, "We're lucky to have you, adept. I'm no Battlemage. I'm much more comfortable in the stacks than in the field." This page was last modified on 24 February 2019, at 21:15.